What does traditional masonry have to do with computational design and architecture? A three-week experimental workshop at a design school in India explores the intersections between the two seemingly opposing concepts while making a subtle suggestion for the future of handwork and technology. 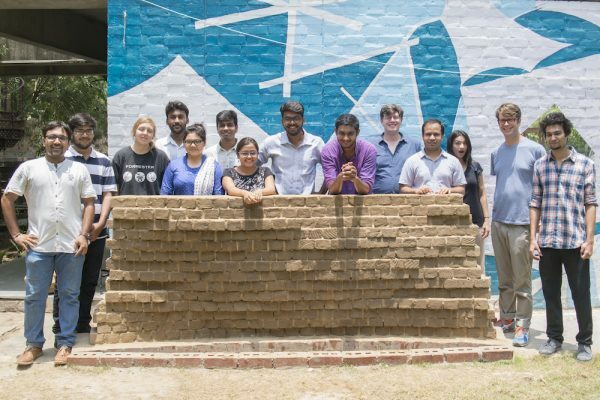 An unexpected team came together for three weeks in India to build a brick wall. 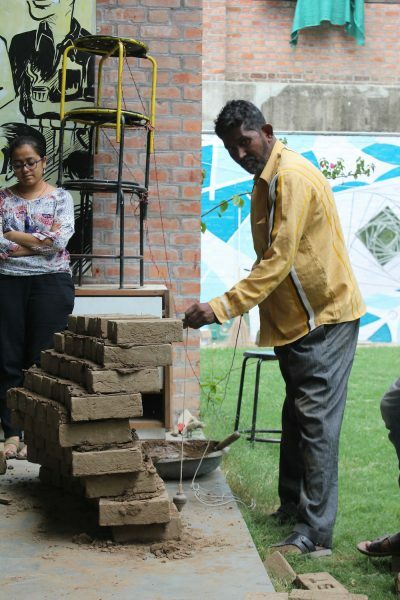 It included a professor with a background in digital fabrication, an architect with digital coding capabilities, a local mason with over 35 years of experience, and a handful of design students from Lawrence Technological University in Michigan and the Centre for Environmental Planning and Technology (CEPT) in Ahmedabad, which played host to the event. The wall in question sought to align the skills of digital tools and handicraft—first, by getting designers, craftsmen, and computer algorithms to talk to each other. Only in doing so would researchers be able to extract yet-unrealized relevant building techniques that could be incorporated into design education emerging from the convergence of diverse sensibilities, skillsets, and cultural backgrounds. At the time, associate professor of architecture at Lawrence Technological University James Stevens and his colleague, assistant professor of digital design and fabrication technologies Ayodh Kamath, discovered the common research interests in craft and technology; Stevens’ interest stemmed from a tool-fabrication side while Kamath’s came from a computational side. The two have collaborated in previous, similar workshops, which were developed in hopes of discovering relevant craft applications to the future of digital technology. In June 2016, their continuing research brought them to CEPT’s Design Innovation and Craft Research Center for the Digital Corbelled Wall project. The project began with finding the limits of failure. 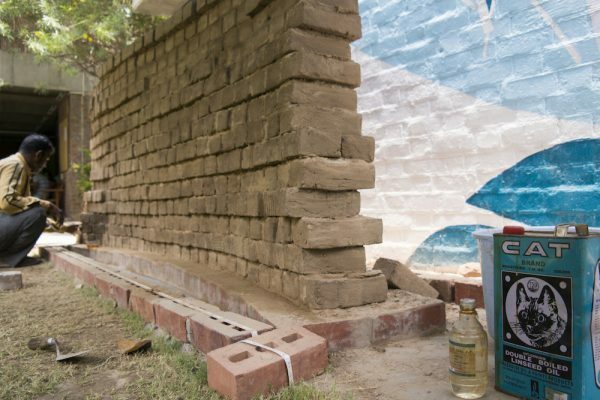 The mason started to build a corbelled wall of unfired clay bricks, characterized by its wave-like form that results from each brick inching out a little more than the one below it. “We thought, let’s keep corbeling until it collapses, so we know the maximum length that a brick can stick out before it falls. That’s very difficult to calculate from first principles because as much as it depends on the center of gravity of the bricks, it also depends on things like stickiness of the mortar, or the variations of the human hand—things that you can’t really calculate,” Kamath explained. The exercise was a metaphor for how digital designers need material knowledge before they even start writing a code. Fig2: Sujauddin, master mason at work. CEPT, India, June 2016. The parameters from that test wall informed the algorithm that generated a parametric model of the wall that the team eventually aimed to build—except this model wasn’t a static, precise form but one that was constantly evolving and re-making itself in response to the mason’s hand and variations on the ground. 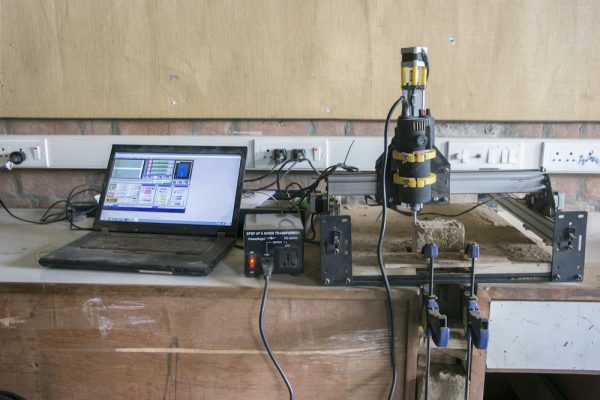 Using a mobile computer numerical control machine, the students milled the bricks according to the script by a certain amount to achieve the corbelled effect generated in the model, which was created according to the test wall built without instruction from the experienced mason. Those working on the digital corbelled wall developed a work ethic based on pragmatic answers to problems that could be solved in the present without compromising certain ideals. Stevens, who began as a junior faculty member at Lawrence Tech in 2008, was hired to start a digital fabrication lab—except there weren’t any tools or equipment or resources. “At some point, it hit me that most architects in the world, including the US, can’t afford a million-dollar lab. So I set out to work digitally, but at the lowest price point. I don’t mean that to say that I want it to be cheap, I just want to maximize my ability to do the most design work with the least resources,” he said. He went on to design what he calls a suitcase CNC mill, a variation of which was at work on the digital corbelled wall project. As much as Stevens is involved in future technologies, he aims to strip away the romance of digital fabrication as a futuristic practice and argues for the time-tested best practices, even if emerging from a different technological era which brought him to India. “What I wanted to do was to look to the past, at the origins of design and architecture, making and materials, and understand where they go in the future, but operate in the present,” Stevens said. He addressed an emerging school of thought that values the tacit knowledge of handicraft—a school that seems to be existing on the fringes of industry and academia. This notion, perhaps most poetically and popularly articulated by Matthew B. Crawford in the book Shop Class as SoulCraft argued for the need for cultures to value the intellectual content that a maker brings.1 Considering India’s unique condition of a skilled labor-intensive construction industry, this idea was pertinent. “The mason that we have working with us—his intellectual capacity is as crucial as anyone else’s,” Stevens reiterated. Kamath came from the same school of thought, however a step closer to the Indian context. With a Masters in design computation from MIT, his work focused on computational tools in architecture while employing indigenous materials and craft processes. He said, “My primary concern is that we have access to software but not to automated fabrication technologies. And even if you bought the machine, the investment will be too much. That set me on to thinking about how I could take design information that was generated on a computer and translate that into a format that is understood by a person.” It is a format more suitable to the local condition where human labor is more accessible than a highly sophisticated digital fabrication setup. The digital corbeled wall project aims to find synergy between man and machine to create more aesthetically diverse forms while being economically viable. A participant of the workshop, Dustin Altschul from Lawrence Tech, picked out this particular learning as especially valuable to him. As a result, the wall portrayed the difference between ideologies—whether that ideology is in making a machine that replicates what a human can do, or one that extends the capabilities of the human hand with added diversity and efficiency. The implication here is that we don’t have to pick sides. In nostalgic perceptions, digital fabrication becomes the enemy. Yet it is a highly efficient tool that could enhance the work of human imagination as well as limit it, depending on how it is utilized. David Pye wrote of this co-dependent narrative in 1968, when he suggested that craft and the industrial mode of production are intrinsically intertwined.2 A project like the digital corbelled wall proves that the post-digital offers all the more opportunity for a symbiotic relationship. Fig 4: Sujauddin adding the final touches. The Digital Corbelled Wall at CEPT, India, June 2016. The completed wall, standing in the evening light in the leafy CEPT campus, has a particular philosophical bent suggestive of the future of architecture and education. It is suggestive of the kind of architects, designers, thinkers, or policymakers that these students could possibly become. It is suggestive of the kinds of buildings they might design and the decisions they might take when faced with mistakes, small economies, limitations, local materials, makers, and contexts. Architecture and design demands independently critical thinking all of the time. Engaging designers and architects in the act of making has a direct effect on the stance of those independent minds. 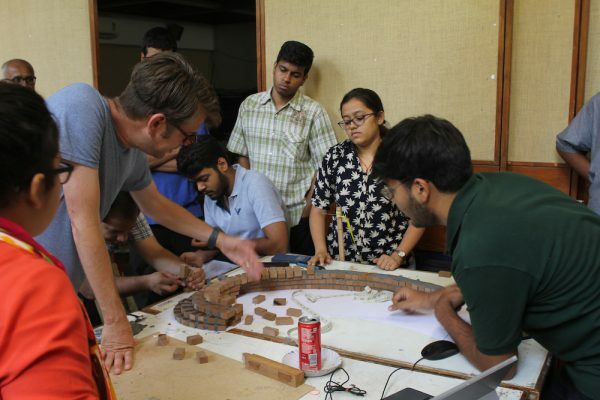 Fig5: Students from Lawrence Tech, Michigan, and CEPT, Ahmedabad, India with the completed Digital Corbelled Wall, at CEPT, India, June 2016.